Dheeraj's Biz Blog: Why Green means ‘Great Retail’? Why Green means ‘Great Retail’? More and more organized retailers, especially supermarkets, are noticing each other in their store catchment areas. The store differentiation is reduced to pretty little and is moving on to building price perceptions and loss leaderships – this is not good for a 3+% net margin industry. When a shopper is deciding where to shop, especially if the shopper is green conscious, having a green attribute on your store and its merchandise can be a sure eye catcher. There may not be too many of the green conscious shoppers in all neighborhoods, but more and more families have a young son or daughter or spouse working for a western oriented industry (like IT, BPO, ITES, etc) who are aware of what green means, are not too happy about dirty polluted cities and might influence the choice of shopping places. Giving an additional reason for shoppers to try out your store could only add to the store traffic. Green conscious shoppers are already avoiding plastic bags on purchases that they could manage by hand or in a cloth bag. Reminding shoppers at the checkout point through a signage could result in cost savings on plastic bags, in lesser checkout time for bagging and in potential extra sales of cloth bags. There could potentially be private label brands on store shelves with efficient packaging, a green tag and a lower price point (lower price point due to the cost saving from the efficient packaging and other evident private label efficiencies). This could be a significant price differentiation for private labels in some categories that require redundant packaging. In the US, concentrated and efficiently packed detergents resulted in significant price point changes. Retail industry experiences one of the highest attrition levels among the domestically oriented industries in India. 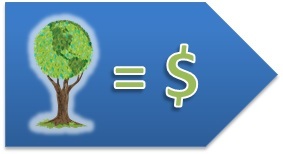 Building a perception of being ‘Green’ would give a positive feel to employees resulting in better employee engagement. This would also have a good impact on Public Relations, when people realize the being ‘Green’ implies lesser contribution to the dirty roads and nallas in their neighborhood. India is one of the more densely populated countries in the world. The inconveniences of pollution are only going to become more and more evident as our population density increases. Sooner or later, the typical Indian consumer is going to become green conscious. Getting a head start on this front, before other retailer’s catch on, could result in stronger recognition with green conscious customers.